Have you ever participated in a blog swap? I mean, not an actual swapping of blogs, I don't know the proper term. It's when a blogger hosts a swap, people sign up, those participating get paired off or randomly assigned someone, then you send your person something and you get something in return. Kind of like that. Well, I joined in on my first swap and it was put together by the fabulous Danielle over at Take Heart. She hosted a "Scarfament Swap" this past month. You were to spend no more than $20 on a scarf and ornament for another blogger and mail them their goods by Dec. 1st and you would get an ornament and scarf from someone else. Buy it, make it, whatever, just get it there by the 1st. Clearly I went with the color teal. I hope she likes a little red because I felt it made it Christmas-y. 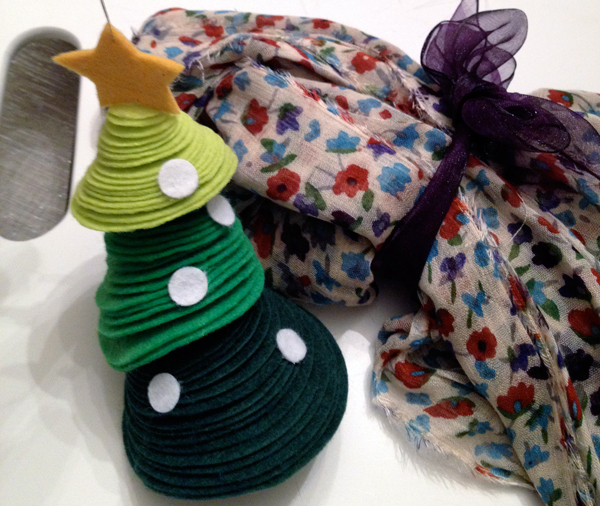 I made the ornament and found that scarf while I was out and about one day. I kind of wanted to keep it. I liked the little sparkle in it - I hope Nicole did. It didn't say anything about liking sparkle, but, it didn't say anything about not liking it either! And, based on my super helpful comments on my favorite colors (pink, orange, teal, red, black, purple) this is what Nicole came up with for me! I love them (sorry about the poor photo). The ornament is awesome and is already up on the tree and I can't wait to wear my new fun scarf! Anyway, all that to say, thanks Danielle for hosting the swap and I had a blast. would love to know how you made the ornament? Love it! Oh my gosh, the ornament you made her is so cute! And I love the scarf you got! Thanks for the compliments ladies! Jill, I'll email you but here's the short of it: glued some paper to the inner circle of a wooden embroidery hoop, decoupaged a doily down then a little scallop circle, covered it all with more decoupage and then added a fabric rosette with some little fuzzy balls. 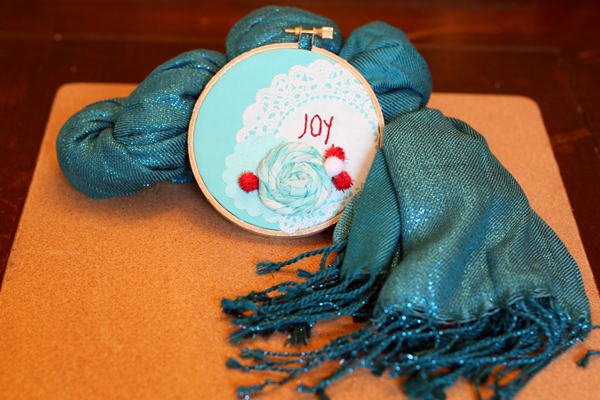 I lightly wrote the word JOY on it then stitched it with some red thread. Put the outer hoop on and painted it with glitter. Glad you liked it! It was fun to make. love, love, love! i am blogging about the scarfament on friday - so be sure to link up friend! ps: i miss you. You both totally scored! I just took part in my first blog exchange "cold hands, warm hearts." We swapped mittens/gloves and an extra little pretty. So fun getting them in the mail. And I've made a new bloggy friend down in Texas! Thanks for sharing. Your ornament is cuuuuuute. What a pretty scarf! And a lovely blog too! So glad I stumbled upon it through Danielle's blog.